NEW ROOF Coun Gwen Lowe with FOBS and Northern Rail representatives. Work has begun to repair the broken roof panels at Batley Railway Station. The glass panels will be replaced by Northern Rail, which runs the station, as part of a campaign by Friends of Batley Station (FOBS). Coun Gwen Lowe (Lab, Batley West), who has been at the forefront of the project, said: “Some of them were totally smashed and water would flood into the subway every time it rained. “And when you walked into the station it was just an absolute eyesore. She said a total of 18 glass panels were in the process of being replaced. “Since FOBS has formed we have achieved so much already,” she said. Coun Lowe said the group continued to receive good feedback for its work tidying the station and campaigning for improvements. She invited anyone interested to join the group for its next cleanup day, which will be held on Saturday September 5, 10.30am. The group’s efforts so far have included new plants, weeds being cleared and new signs being put in place. The station was also expecting a new paint job in the not too distant future. 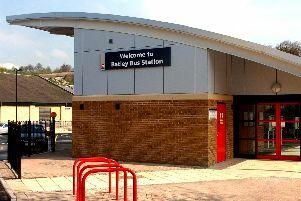 The campaign, which was backed by the Batley News, started in autumn last year thanks to the efforts of residents, Batley councillors and then prospective parliamentary candidate Jo Cox (Lab, Batley and Spen) who thought that the town’s station deserved better.